Bishôjo Senshi Sailormoon is my favorite Japanese Anime of all times. The only way I will watch it is in the original with English sub-titles, because I can't stand what DIC did to it. 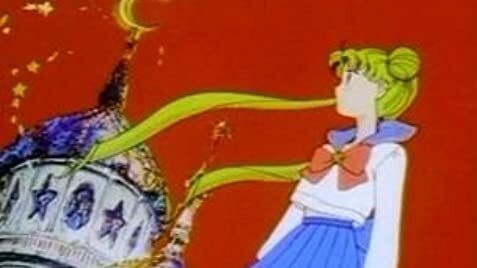 If you want to see people with pure hearts, and who do what they have to do to save the world then Sailor Moon is the anime for you. Usagi may be everything that people (heroines) shouldn't be; a glutton, crybaby, boy chaser, who only wants to eat sweets, do things for free, and read manga but she is the purest in the group. She would give her life time and time again to protect her friends, family, and the world. The rest of the Senshi have their flaws and good points as well. Really those who complain that it's a bad anime should watch it closer and read through the unwritten lines. There are things here that are barely seen in the real world anymore; loyalty, unconditional love, and doing the right thing for the right reason. Try and see that even though these girls aren't perfect, they are the perfect heroines. They are very real, with human flaws. You see people like them everyday. Even though you can't see the hero in them it's there for those perceptive enough. In the series, the male Shitennou Zoisite and Kunzite are portrayed as lovers. In Sailor Moon (1995), Zoisite was made a woman to tone down the adult-themed relationship. No such relationship between the pair exists in the original manga. Ami: Knowledge is something you learn on your own, computers don't make you smart! Gaboran: Shut the hell up! In the Hebrew dub the Senshi said "Wake up" when transforming. When the studio realised that they were supposed to say "Make up" as they do in the original Japanese they decided to keep having them say "Wake up" as they felt it went better with Hebrew. In the Hebrew dub, the extended version of "Kaze Mo, Sora Mo, Kitto!" is used in place of "Moonlight Densetsu" in the final episode. In the Korean version, all Japanese words which appear on-screen have been either removed or simply left blank.